A miniature classic! 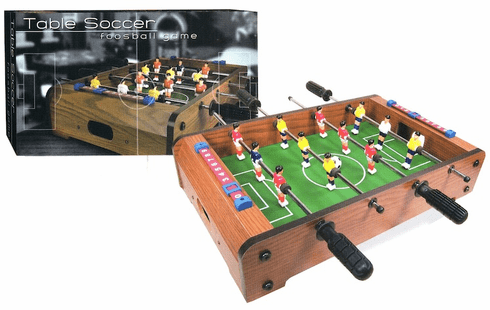 Tabletop soccer or foosball is a highly competitive sport requiring fast reactions, nerves and cunning. This mini table top futball game is a superb introduction to the fast paced and addictive play of this classic table top game. With two handles per team, this table top foosball game is easy to play, even for young players, and seriously fun for all the family. Twist and slide to position your players and spin the bars to strike! The table top football game set includes tabletop game with easy-glide playing bars, balls and built-in score sliders for each team.